First week on the job jitters? We’ve all been there. Last week we were excited to welcome a new, but familiar, face to our shoreside staff team – Jackie Harris has joined Casco Bay Lines as our new Administrative Assistant. While Jackie is technically the newest member of the CBL crew, she’s no stranger to the comforting thrum of the terminal on a sunny afternoon. A University of Maine student studying marketing in Orono, Jackie spent three summers working in the Casco Bay Lines ticket office. After graduating in May, she knew she wanted to stay on the waterfront and went to work for a hotel downtown. When she learned about the opening at Casco Bay Lines, she quickly applied. A love for Casco Bay, and an infectious positive attitude, are just a few of the reasons Jackie rose to the top of the applicant pool – and we couldn’t be happier to welcome her back in a new role. On a day-to-day basis, Jackie is sure to become a Jill-of-all-trades, assisting our crew here at the terminal – helping our sales and marketing team with events, scheduling meetings, ordering office supplies, and supporting the Board of Directors meetings, among (many) other things that will keep our office running smoothly. 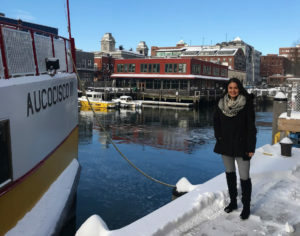 Jackie’s connection to Casco Bay runs deeper than just her time in our ticket office – her grandfather grew up on Great Diamond Island, and she loves visiting the island during the summer. For Jackie, being on the island is like an escape from reality, and she looks forward to spending time with her family at their cottage. Her favorite thing to do when she is on the island is to go for a run on the waterfront. “Nothing beats an island run,” she says. While she is only one week into her new gig, Jackie told us that she’s excited to take on this new challenge and grow into her role. If you see her around, be sure to give her a great, big, Casco Bay welcome. As you know, we couldn’t do what we do without our terrific crew.